This brief provides a summary of the CP MERG's history, mission, goals, and membership. The Child Protection Monitoring & Evaluation Reference Group is a global level forum established in 2010 for collaboration and coordination on child protection monitoring, evaluation and research. The CP MERG aims at strengthening the quality of monitoring and evaluation, research and data collection in child protection, through the development of standards, tools and recommendations, which are relevant for the sector. It also helps to facilitate coordination, communication and shared learning across organizations and entities on monitoring and evaluation of child protection. 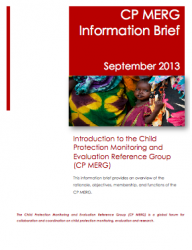 Learn more about the CP MERG here.